Over 20 citizens spoke last night at the first public hearing on the I-66 Outside the Beltway project. Almost all speakers voiced support for transit over widening the road. Several speakers said they moved to the Dunn Loring area to be in a walkable/bikeable neighborhood that would be negatively impacted by the project. 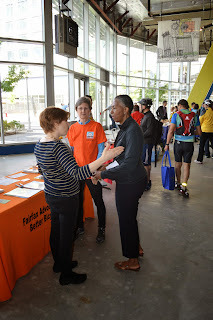 FABB's Sonya Breehey spoke on behalf of FABB in support of the extension of the Custis Trail parallel to I-66 and bike/ped facilities on the rebuilt bridges. You can support this effort by telling VDOT to include the parallel trail as part of the project. Attend the second public hearing tonight at Oakton High School, 2900 Sutton Road, Vienna, VA 22181, from 5:30-9:00. See the FABB Blog and FABB I-66 Info Page for more info. Written comments may be submitted through June 18th by email to Transform66@VDOT.Virginia.gov. Your comments do make a difference. I think we all agree that improvements to the I-66 corridor are necessary but to truly transform I-66 for the future, we need long-term solutions that are legitimately multi-modal, maximizing public transit, and biking and walking connectivity. I truly appreciate the incorporation of bicycle and pedestrian facilities for reconstructed bridges. These connections are imperative to ensuring this massive highway project does not sever neighborhoods, and that our bridges remain a humane place for residents to walk and bike transit, schools, or anywhere they need to go. I am concerned however that while the Tier II Environmental Impact Statement indicates VDOT has studied the feasibility of a parallel bicycle facility; the trail still has not been included in the project. An I-66 parallel trail would provide significant connectivity to the northern Virginia transportation trail network. A recent study showed that 25% of Fairfax County residents live within a mile of I-66 or within 1/2 mile of either the Fairfax Co Parkway or W&OD Trails, both of which would be connected by an I-66 parallel trail. In fact, over 500 county residents provided comment to VDOT asking that a parallel trail be part of your multi-modal solutions. 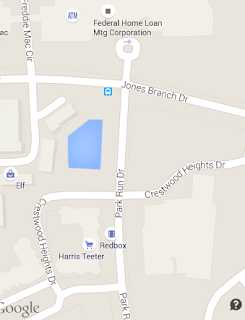 Employment centers throughout central Fairfax County. This bike and pedestrian connectivity is what will help make any TDM program more successful. While the EIS suggests a trail would require additional ROW in certain areas, VDOT should seek to reduce those impacts by fitting as much of the trail within the existing project right-of-way minimizing impacts to neighbors. It is also essential that VDOT provide a safe and consistent trail for its entire length to ensure maximum use for all ages. Circuitous routes outside the immediate I-66 corridor is inefficient, confusing, and will reduce its successfulness. If absolutely necessary to use alternative routes, upgrading the bike and pedestrian facilities, including wayfinding signage would be critical. I also urge you to address bike and pedestrian crossings at Rt. 50, 123 and other significant interchanges and crossings where bridges are not being rebuilt. Now is the time to take the long view. Providing safe accessible connections for people to bike and walk to transit, and along and across the I-66 corridor, will offer residents and commuters transportation options that are truly a multi-modal solution. Written by Sonya Breehey. Sonya is an active member of Fairfax Advocates for Better Bicycling. Jointly posted on the WABA Blog. The Virginia Department of Transportation (VDOT) recently unveiled concept plans for an extension of the Custis Trail along I-66 outside the Beltway in Fairfax and Prince William Counties. Hundreds of Fairfax County trail users contacted VDOT asking for the trail extension as part of the I-66 project. While it is exciting to see the trail one step closer to reality, VDOT still has not included the trail as part of the I-66 project. VDOT is asking for additional feedback on how the parallel trail will benefit you, your commute, and your neighborhood. 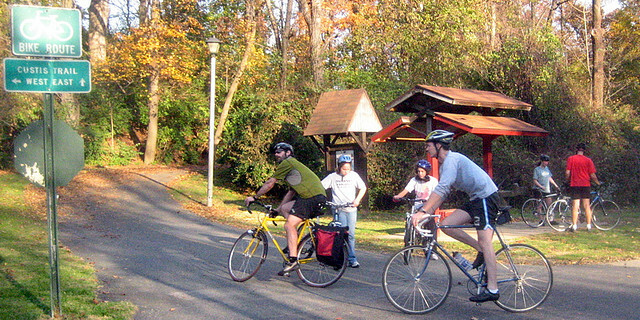 The Custis Trail is one of the most successful bike trails in Northern Virginia, providing a popular recreation destination and critical bike-commuting route for thousands of commuters each year. In 2014, over 500,000 people rode a bike or walked along the Custis Trail. A similar trail outside the Beltway would be a major benefit to bicyclists in Northern Virginia. 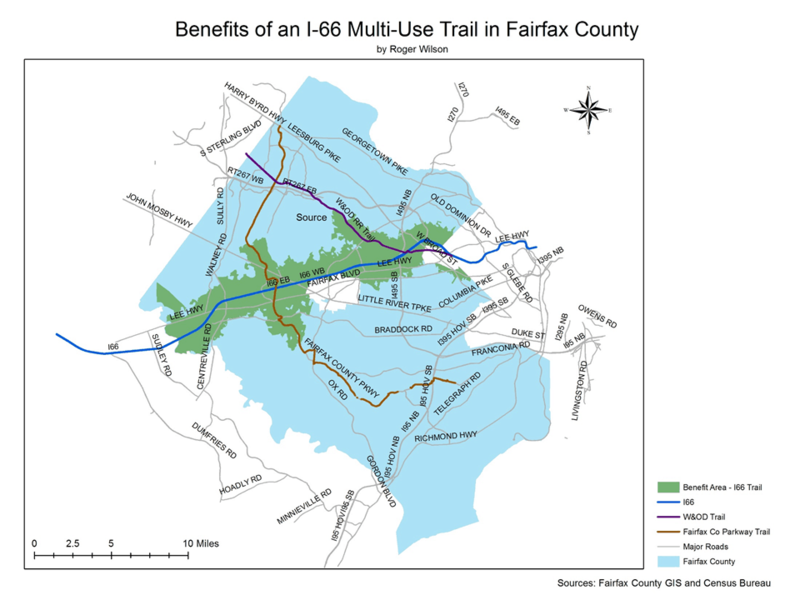 A recent study showed that 25% of Fairfax County residents live within a mile of the proposed I-66 trail or within 1/2 mile of either the Fairfax Co Parkway or W&OD Trails, both of which would be connected by an extended Custis Trail. 25% of Fairfax County residents would live within a mile of the proposed I-66 Trail or within 1/2 mile of the Fairfax Co. Parkway or W&OD Trails. While there are right-of-way concerns and some backyards may be impacted, similar challenges were faced when building the Custis Trail. VDOT should seek to reduce the impacts by fitting as much of the trail within the existing project right-of-way and minimize impacts to neighbors. Now is the time to take the long view. Providing safe accessible connections for people to bike and walk to transit, and along and across I-66, will offer residents and commuters transportation options that enable us to shift more trips to biking and walking. If you want the I-66 trail to be a reality, here is how you can help. 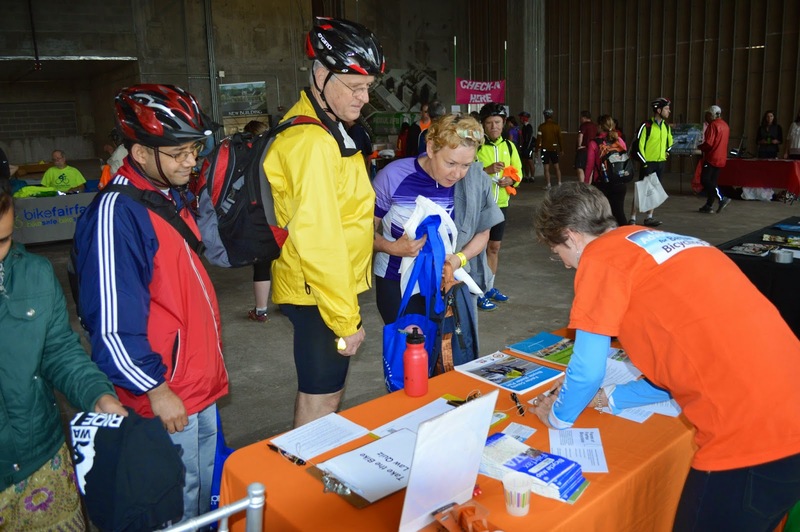 Attend one of the I-66 Public Hearings and tell VDOT you support bicycle improvements, especially extending the Custis Trail, as part of the I-66 improvement project. Hearings are scheduled from 5:30 to 9:00 pm. Written comments may be submitted through June 18th by mail to Ms. Susan Shaw, Megaprojects Director, at the VDOT District Office address above, or by email toTransform66@VDOT.Virginia.gov. Reference “Transform 66 Outside the Beltway” in the subject line. Copy your public representatives on your email to make sure everyone gets your message for better bicycling! Don’t wait until June 18th, send your comments now. 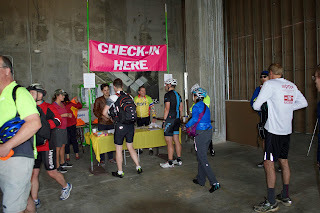 Contact your neighborhood association to let them know how improving bicycling as part of the I-66 project will help your neighborhood, and urge them to get involved. 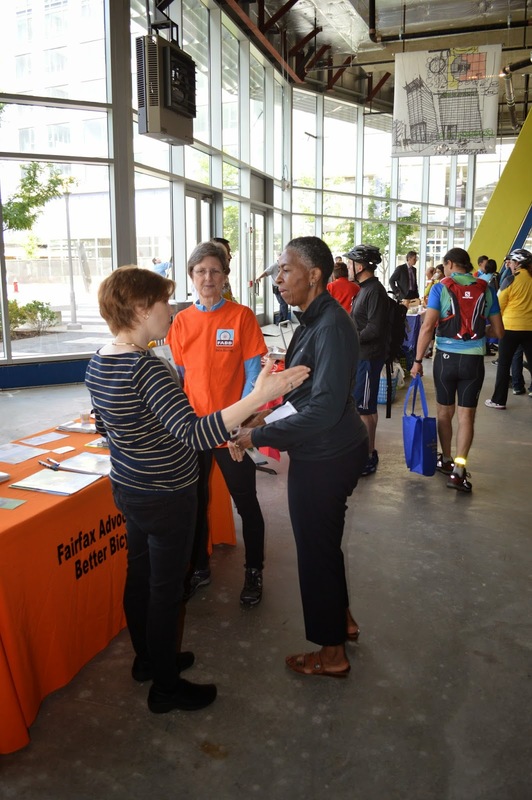 Visit FABB’s I-66 page for more information about efforts to include bicycling in the I-66 project. Tour de Fat is Saturday! DC Metro's biggest bike party, Tour de Fat, is Saturday, May 30, at Yards Park next to Nats Stadium. FABB will be there checking IDs and helping to raise money to improve biking in Fairfax. The free event begins at 11 a.m. with a costumed bike parade. Throughout the afternoon you can enjoy great entertainment on two stages, play games, ride trick bikes, and enjoy New Belgium beverages. We still need a few volunteers for the afternoon shift, from 1:30-5pm. All volunteers receive two beverage tokens. Please consider helping FABB at Tour de Fat. Sign up via Volunteer Spot or contact me. Hope to see you there. 1. More roads = less traffic. This is the granddaddy of all traffic myths, one still held dear by the average driver and certain precincts of state highway offices. More funding for more roads is on the way in Texas, where the governor declared that residents are “tired of being stuck in traffic.” On Memorial Day, it will assume the stature of an intuitive truth: If they just built more roads, we’d be home by now. 2. Faster roads are more efficient roads. Speaking of efficiency, common sense says that when drivers are humming along at or even above the speed limit, highways are performing at their best. The German autobahn, with its (shrinking) speed-limit-free zones, is often offered as a shining example. It must be those slower drivers who are holding things up! Tour de Fat is next week! DC Metro's biggest bike party, Tour de Fat, is next Saturday, May 30, at Yards Park next to Nats Stadium. 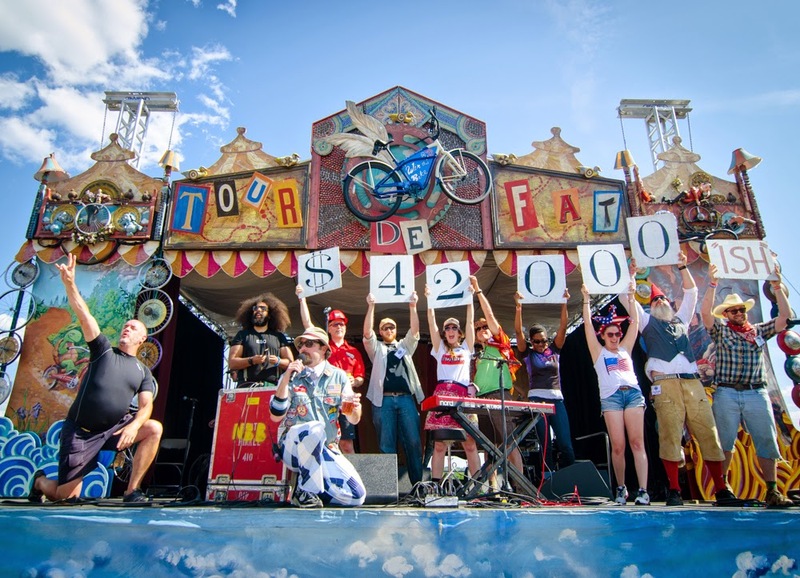 The "Tour" is a celebration of all things bike sponsored by New Belgium Brewery, makers of Fat Tire Ale. The free event begins at 11 a.m. with a costumed bike parade. Throughout the afternoon attendees enjoy great entertainment on two stages, play games, ride trick bikes, and enjoy New Belgium beverages. Proceeds go to bike advocacy organizations including FABB. In turn we supply volunteers to check IDs. We still need a few volunteers for the afternoon shift, from 1:30-5pm. All volunteers receive a 24 oz stainless steel water bottle only available for TdF volunteers. They also receive a $5 coupon for the merchandise tent, and beverage tokens. Please consider helping FABB at Tour de Fat. Sign up via Volunteer Spot or contact me. Hope to see you there. Deloitte University Press recently published a report on modern transportation options: Smart mobility: Reducing congestion and fostering faster, greener, and cheaper transportation options. The study showed that bike commuting could significantly alleviate congestion and save commuters money. What is needed are significant improvements to bike infrastructure and promotion of bike commuting. 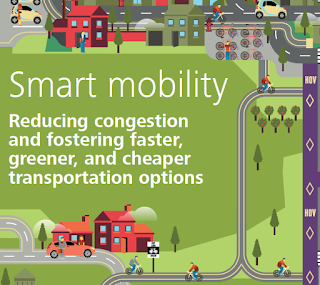 In an ideal scenario in which employees living within 5 miles of work commuted by bike 2-3 days a week, it's possible to reduce vehicle miles traveled by 13.1 billion and to achieve mobility savings of $27.6 billion. Also included in the report is an interactive map of the U.S. showing bike commuting potential (1-5 miles), investments in bike infrastructure, and where bike sharing exists or is planned. The areas with higher concentrations of potential bike commuters cluster around suburban “edge cities” containing commercial centers such as Reston, Tysons Corner, Herndon, Manassas, and Woodbridge. The identity of some of the “hot spots” may be counterintuitive, particularly Tysons Corner, which used to be a national symbol of car-friendly and congested development. But these areas are typical of what we found in our nationwide study, and “bikeability” now forms a major part of Tysons Corner’s long-term development plan. Medium-density suburban neighborhoods located one to three miles away from thriving commercial developments offer surprisingly good opportunities for increasing bike ridership. Further down the I-267 Dulles Tollway is Reston Town Center, another car-friendly suburb that has begun planning for 13 bikeshare stations to sustain its economic growth and attract younger residents. AAA recently announced that it will provide bicycle roadside assistance to all members starting May 1. According to the Bicycle FAQ, recumbents, trikes, and other bikes that cannot be transported on a standard bike rack are not included. If you are towing a trailer, it is covered if it can fit into the service vehicle. The service is available on a "normally traveled road." If you're riding on the W&OD Trail or some other major trail and you break down, you'll need to move the bike to the nearest road. Better World Club has been providing bicycle roadside assistance for several years. The program includes Bike Discounts, information on traveling with your bike and more. You can also purchase just the bicycle only service. What a great day for Bike to Work Day! 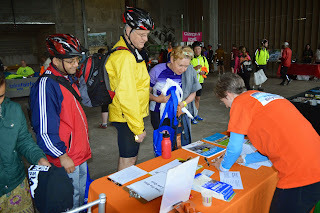 FABB reps were out in force signing up people for our newsletter and spreading the bike love. Here are some photos from the Reston event where over 500 people registered. 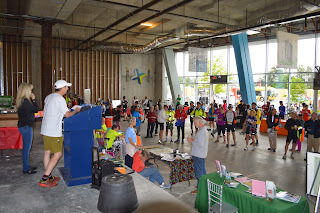 Thanks to Reston Association for organizing the event and Comstock Partners for providing the venue, at the Wiehle-Reston East Metrorail station. Today VDOT sent out the following news release entitled Paving Brings Opportunity for Bicycle Improvements: New striping for bike lanes and other enhancements at 20+ locations. 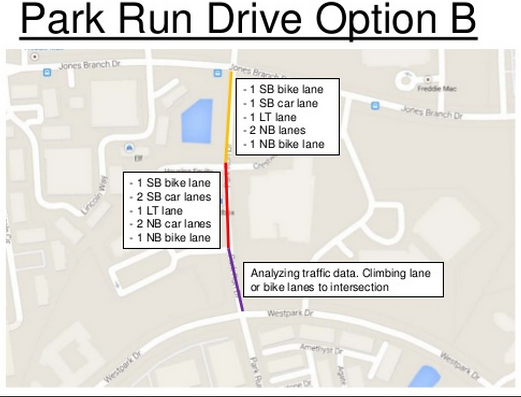 We've been reporting on the many meetings that Fairfax County and VDOT have been hosting to gather feedback on these projects, including the meeting tonight on plans for bike lanes on Park Run Drive in Tysons. It's great to see VDOT and Fairfax County working together to take advantage of the repaving of several roads in Fairfax to make them more bike friendly. The addition of bike facilities in these projects adds almost no additional cost and increases the safety for all road users. FAIRFAX—With the Virginia Department of Transportation’s largest season of paving for northern Virginia underway, there comes good news for bicyclists: About 20 road segments will see enhancements such as bike lanes and sharrows during this year’s regular surfacing and striping. Several “road diets,” where in certain locations, a travel lane is replaced with elements such as left-turn lanes and bicycle lanes, which can help reduce speeding and increase safety for all users. VDOT has seen successes with road diets on Soapstone Drive, Lawyers Road and Oak Street, and with sharrows on Westmoreland Street, says Randy Dittberner, VDOT’s traffic engineer for northern Virginia. County and VDOT staff met with the public and local supervisors in each affected area to discuss the changes and solicit input and feedback. See a complete list of planned enhancements. The paving and new striping will take place starting in June. More localized project details will be announced as paving schedules are finalized. See more on the Soapstone Drive, Lawyers Road (photos on Flickr) and Oak Street projects. Update: See the Fairfax County news release More Than 34 Miles in New Bicycle Lanes to Be Added in Fairfax and the Reston Patch article with the same title. 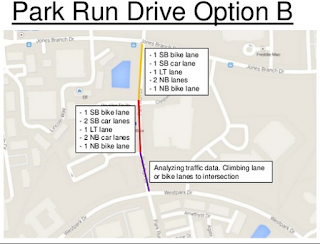 Fairfax County and VDOT are holding a public meeting on Wed. May 13 to discuss proposed changes to Park Run Dr in Tysons that will provide better bike facilities than contained in the original plan on which we reported earlier. The meeting begins at 7pm at Westbriar Elementary School, 1741 Pine Valley Dr, Vienna, VA 22182. Cyclists are encouraged to attend the meeting to support this new concept. 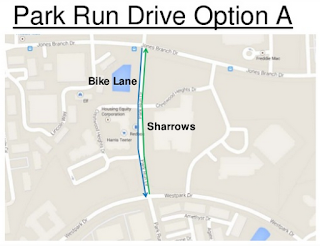 The original proposal included only a climbing lane between Jones Branch Drive and Westpark Drive. 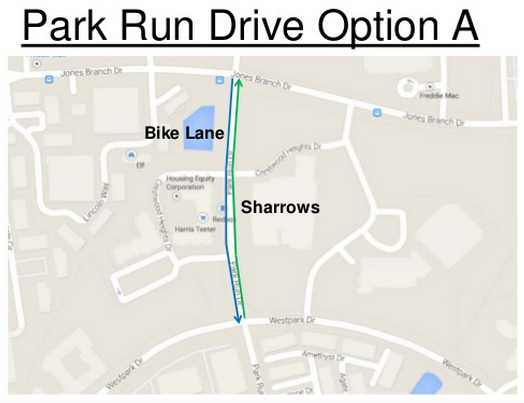 This new proposal includes bike lanes in both directions from Jones Branch Drive to Tysons Boulevard. The proposal changes the number of lanes and the lane configuration to provide room to add bike lanes. 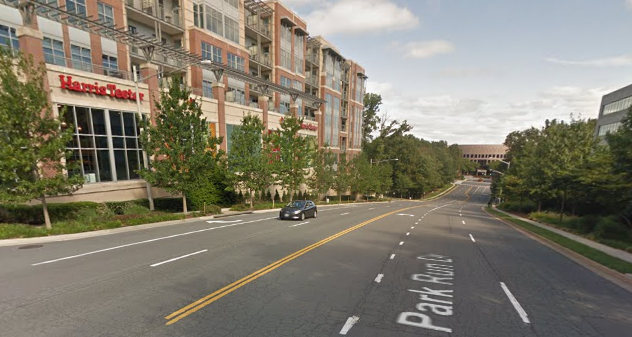 The parking would remain on Park Run Drive between Westpark Drive and Tysons Boulevard. View the concept. FABB Instagram users (or wannabe users) have another reason to post pictures now. New Belgium is celebrating the upcoming Tour de Fat (May 30) with a Beers, Bikes, & Bemusement Instagram Photo Challenge! The Grand Prize is a New Belgium Cruiser Bike, and other prizes include some great bike gear. 1. Snap a selfie with your bike while making sure a District landmark is in the background. 2. Post your photos to Instagram and hashtag them with #TourDeFatDC to enter. Unlimited entries per person. 4. Check back weekly to see if you've WON! Prizes will be awarded as Tour De Fat approaches. The Grand Prize winner will be announced on May 25th. Visit Newbelgium.com/dc for Official Rules. If you are still thinking about volunteering to help FABB support this year’s Tour De Fat on Saturday, May 30th, then perhaps the following will further entice you. New Belgium and WABA are holding the annual Thursday night Volunteer Party at Churchkey at 1337 14th Street Northwest, Washington DC (second floor) on May 28th from 6-9pm. All volunteers are invited to attend and will receive one free beer on New Belgium. Also, WABA will be selling raffle tickets for a New Belgium cruiser bike that will be raffled off at 9pm. The projects are spread across Arlington, Fairfax, Loudoun, and Prince William counties. They were selected by the TPB based on how well they support or advance regional goals, including providing more transportation options, strengthening Activity Centers, improving access to transit, and serving disadvantaged populations. Between now and May 22, 2015, Fairfax cyclists have an opportunity to recommend changes for better bicycle access to the Fairfax Center Area as part of proposed changes to the Fairfax County Comprehensive Plan. More info is at www.fairfaxcounty.gov/dpz/fairfaxcenter. The Fairfax Center area is just west of Fairfax City generally between Route 50 in the north and Route 29 in the south. Your recommendations may be considered by county staff, reviewed by a planning task force, considered at a public hearing, and approved by the Board of Supervisors. A long process, but it's the way important changes are made in the county. Cyclists are needed to review the recently approved Bicycle Master Plan Route Map to ensure that it is properly referenced in the plan being considered. The proposed plan includes information about a future rail station at Fair Oaks Mall, community design standards, and planned improvements in the City of Fairfax. The Bicycle Master Plan is referenced but we think more specific bike information should be included in the Center plan. Maybe you have a solution to improving bicycle access to Fair Oaks Mall and the County Government Center from surrounding neighborhoods and Fairfax City, which is only 1.5 miles away. Also, we are concerned that previously approved applications appear not to have included basic bicycle accommodations, according to the table on page 57 of the Fairfax Center Area Study Staff Report. Bicycle parking facilities were either not included or were not considered essential in commercial and residential developments, and no bicycle support facilities were included. In a few weeks more information will be available concerning a parallel bicycle trail along I-66 as it will have a profound impact to the Fairfax Center community. FABB is inviting interested advocates that are familiar with the planning area to review and comment on the planning document under review. Advocates are welcome to send their comments directly to the county but are asked to also send a copy to FABB at info@fabb-bikes.org. Thanks to Howard Albers of FABB for providing the above information. On May 6th children across the nation will be participating in National Bike to School Day. This is the 4th annual Bike to School Day promoted by the National Safe Routes to School Center, as a sister event to its Walk to School Day Fall events. Currently more than 2,000 schools across the country have signed up to participate with 155 schools in Virginia and nearly 40 in Fairfax County. Fairfax County's Safe Routes to School Coordinator has been working hard to increase Fairfax County Public Schools participation and those efforts are paying off. 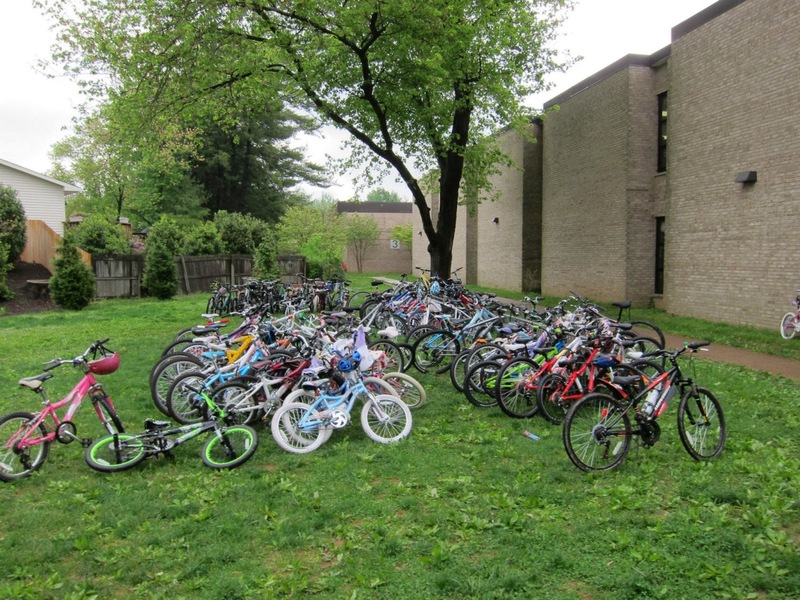 This year the school system has challenged schools to get 100 bikes in their racks. Schools that achieve the "century" milestone will receive 100 bike seat covers as prizes for all the students who participate. Of course, children and parents are encouraged to walk to school as well. Several Fairfax communities have over 5 schools participating in the event. They include Alexandria, Fairfax, Falls Church, Reston, and Vienna. A few schools, such as Navy Elementary on West Ox Road, are participating for the first time. Lots of events are planned including the week-long Bike/Walk Challenge that Vienna elementary schools have been holding for 7 years. To see which schools are participating and to register your event visit the Bike to School Day website. If you haven't already signed up for Bike To Work Day on Friday, May 15, now is the time. 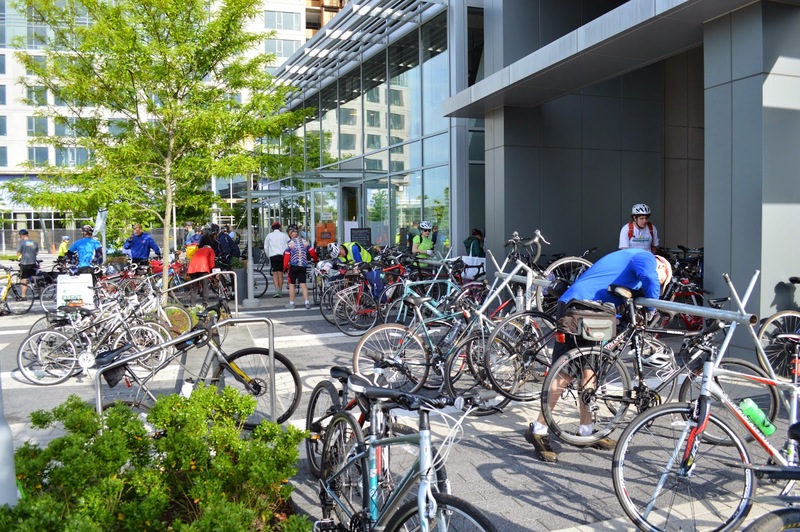 This year Fairfax has 14 Bike to Work Day locations. Look for a FABB representative at most of the pit stops. (We still need a volunteer at the Mt. Vernon-Collingwood pit stop.) We'll be handing out bike maps and talking to cyclists about how they can help make Fairfax a better place to bike. To register for Bike to Work Day go to www.biketoworkmetrodc.org. The Virginia Department of Transportation (VDOT) has announced that it will host public hearings in late May and early June on the latest environmental assessment for the Transform 66 Outside the Beltway Project. Details are below. This is another great opportunity for bicyclists and other citizens concerned about transportation options in Fairfax to provide comments to VDOT. Now is the time to build an extension of the Custis Trail parallel to I-66 and to build bike facilities on all of the bridges. You can review project information at www.transform66.org beginning May 12, 2015. Written comments may be submitted by email to Transform66@VDOT.Virginia.gov. Please reference "Transform 66 Outside the Beltway Public Hearing" in the subject line. Comments must be emailed to VDOT by June 18, 2015 to be included in the public hearing record. 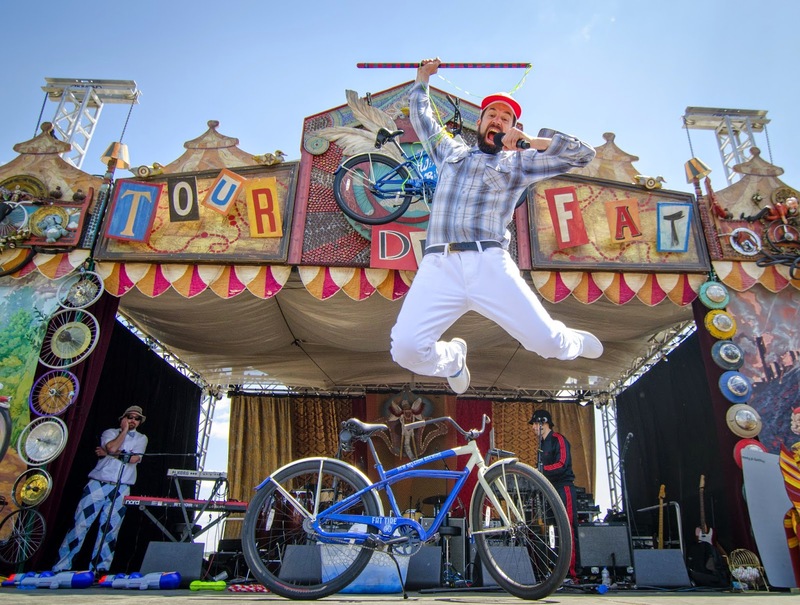 Tour de Fat is a free bike party held at Yards Park located next to Nats stadium on Saturday, May 30. The all day event is sponsored by New Belgium Brewery and is full of music, fun, and games, beginning with a costumed bike parade at 11 a.m. We are still looking for a few volunteers to help out at the event by checking IDs, especially on the afternoon shift. All volunteers receive a unique 24 oz. Tour de Fat stainless steel water bottle and a $5 merchandise coupon. Contact us for more info. Proceeds from beverage sales go toward funding bike advocacy in the DC area including FABB's work. Fairfax County wants to know how you ride to Metro and VRE stations so they can help identify where bike route improvements are needed. Comments are being accepted until June 30. 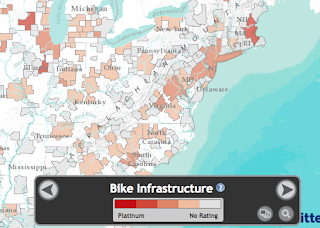 "The Bike Fairfax Wikimapping Project provides commuters and leisure bicyclists the opportunity to help prioritize future bicycle improvement projects. 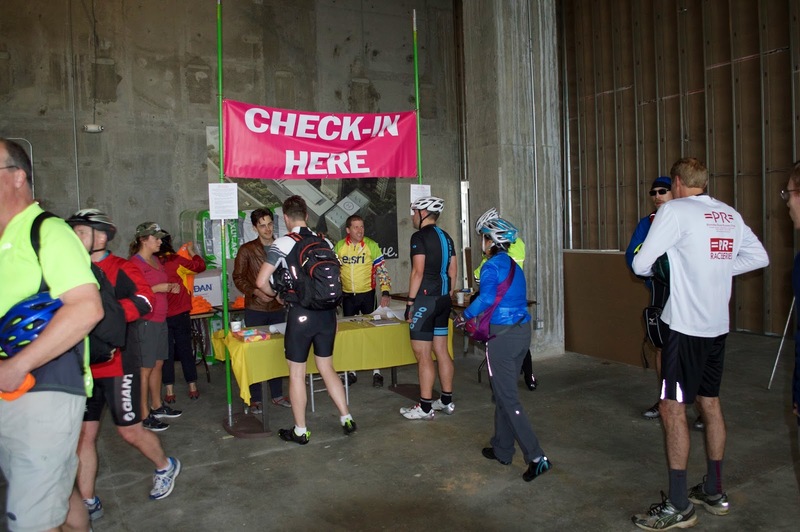 Specifically, we are reaching out to bicyclists to show us what routes are being used to get to Metrorail and Virginia Railway Express (VRE) stations in Fairfax County today. This information will help guide the decision making process on future bicycle infrastructure improvements including wayfinding signage and bike lanes." Fairfax County recently completed a series of public meetings on bike projects that will be added on several roads being repaved. The presentations are available online. These are very low cost projects that improve safety for all road users. Thanks to everyone who supported the bike projects by attending these meetings and/or by contacting officials. Your participation made a difference in overcoming some objections to the projects. We'll be reporting on these projects as they are implemented on the FABB blog, Facebook, and Twitter. If you don't already, please Like us on Facebook and follow our Twitter feed. May is Bike Month and early in the month is one of the first big events. On May 6th, children across the nation will be participating in National Bike to School Day. This is the 4th annual Bike to School Day promoted by the National Safe Routes to School Center, as a sister event to it's Walk to School Day Fall events. Currently over 2,000 schools across the country have signed up to participate with 155 schools in Virginia and near 40 in Fairfax County. Fairfax County's Safe Routes to School Coordinator has been working hard to increase Fairfax County Public Schools participation and those efforts are paying off. This year the school system has challenged schools to get 100 bikes in their racks. Schools that achieve the 'century' milestone will receive 100 bike seat covers as prizes for all the student who rode in. Of course, children and parents are encouraged to walk to school if bicycling to school isn't something they wish to do. Several Fairfax communities have over 5 schools participating in the event. They include Alexandria, Fairfax, Falls Church, Reston and Vienna, with a few new schools that have never participated previously including Navy Elementary on West Ox Road. Lots of events are planned including the week-long Bike/Walk Challenge that Vienna elementary schools have been holding for 7 years. Hear from some parents and kids at two of the schools about why they organize Bike and Walk to School events. National Bike to School day is an effort to promote physical activity and reduce traffic congestion and pollution near schools. Fairfax County Public Schools have compiled information on walking and biking to school on their Safe Routes to School web page.